Expectation versus appreciation is a very simple concept, yet it is one that I find many people struggle with (me included!). It seems that we tend to wander through life with a set of expectations that more often than not trip us up and cause us pain. We have these ideas of how things should be, how people should behave, and sometimes even what the weather should be doing. Why do we do that? That is the million dollar question! An expectation is a strong belief that something should go a certain way or be a certain way. This presupposes that we must have some level of control over what is happening outside of us for there to even be that belief in the first place. Yet we know (normally from past experience) that that is simply not true. In fact, as we get older, most of us realise that we have very limited control over anything that is outside of ourselves. We can only control how we show up, how we respond, how we communicate and so on. Basically, we can only control us and nothing else. Yet we still have this very lengthy list of expectations tucked into our back pocket that we pull out at every possible moment – usually to our own detriment. I feel confident enough to say that there would be a direct correlation between the amount of expectations one has and the amount of let down or pain one feels. Appreciation, on the other hand, is the recognition and enjoyment of the good qualities of someone or something. Appreciation is all about what is in front of us right now. It requires presence and utilises a totally different focus. Appreciation is underwritten by gratitude, and gratitude is an exceptionally powerful emotional state. Gratitude has been proven to improve things like our sleeping patterns, physical health, self-esteem and so much more. Spending more time coming from this place has to make sense: appreciation clearly looks like WAY more fun than expectation! 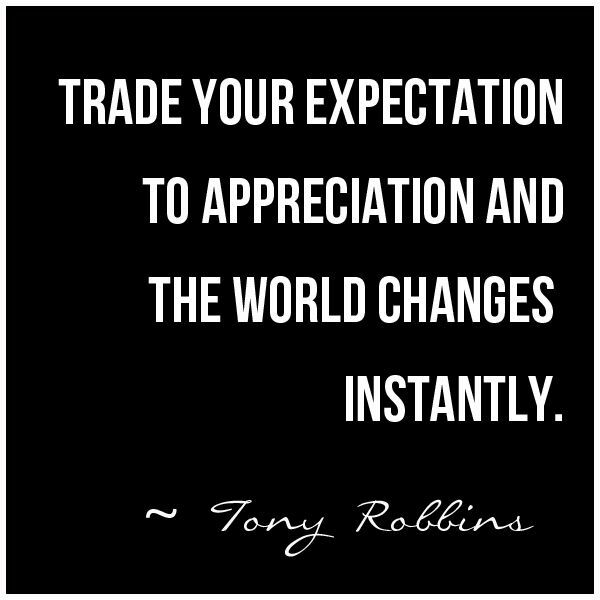 The premise of this tool (which I learnt from Tony Robbins) is that when we can trade expectation for appreciation we enjoy life so much more. We are in the moment and are focusing from a higher vibrational place: from love as opposed to fear. If, in that moment when you experience frustration because your partner hasn’t cleaned the house while you were out (an expectation), you were instead able to appreciate that they welcomed you home with open arms and a cup of tea, how different would the conversation be? What if, when you experienced unfairness and annoyance because you didn’t get the promotion you honestly thought you had in the bag (expectation), you were instead able to trade it for appreciation at the excellent feedback you got on how you could improve next time? Now I am not saying this is an easy path to walk, I know that I have certainly been challenged living by this at times. What I do know though, is that it is certainly the happier path – the path of more joy, acceptance and gratitude. And who doesn’t want more of that in their life?